Damoli Vini is situated in Negrar, near Verona, in the heart of Valpolicella Classica area (ITALY). 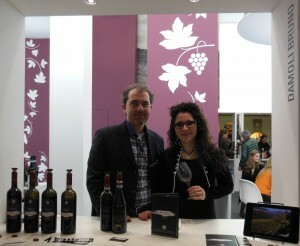 Damoli Vini is a small winery, that was reborn a few years ago, after a break of couple of decade. Our small farm is constituted by my father, Damoli Bruno, as owner and expert in viticulture, my brother, Daniele Damoli, as oenologist and winemaker, and me, Lara Damoli, responsible for communication and marketing. – Biancheté Bianco del Veronese I.G.T. Our vineyard are situated on the hills, in Jago (Negrar), and on high hills, in Mazzano, on the north side of Negrar. These small plots of land provide us the best organoleptic characteristics of our land, thanks to a careful preliminary study of the territory and the exposure of the vineyards. The headquarters of our company is in Negrar, in the locality Jago, a place rich of history and the starting point for our history. We have centuries of hard work behind us, why leave it half done? Do you want to come visit us? Click here! DO YOU WANT TO VISIT US? BOOK YOUR WINE TASTING! Contact us at info (at) damolivini.com. We can agree on your wine tour at our winery and we are sure we can dedicate you the right time. You can also contact us by phone: +39 3408762680. Thank you for your collaboration!